Leading a high-profile athletics/activities program in today’s educational system is a demanding job that requires skills in facilities management, recruiting, publicity, law and much more. The William Woods University Master of Education (M.Ed.) in Athletics/Activities Administration is one of a handful of programs in the nation that trains you in these skills at all levels, from middle school through high school and collegiate. public relations and marketing of the athletics/activities program. The program leads to the initial certification of the National Intercollegiate Athletics Administration Association and is one of the few to be recognized by the NIAAA as meeting the educational requirements toward becoming a Registered Athletic Administrator (RAA) or a Certified Athletic Administrator (CAA). It does not meet Missouri requirements for building-level administrative certification. At William Woods, you’ll be participating in a master's program known for its excellence and for providing a significant number of the leaders in Missouri’s state school system. As one of these students, you will have the opportunity to learn from active practitioners in the athletic field and make the connections you need for leadership and career growth. This degree is designed to fit the schedules of working teachers and administrators and can be completed in two years or less through evening courses taught in convenient locations around the state. You can expect rigorous coursework with real-world relevance, designed and taught by professionals who have proven their expertise. We structure the schedule so as to keep students together, allowing you to develop lasting relationships with peers focused on similar career goals. And, to make this an investment you can count on, your tuition will not go up as long as you stay continuously enrolled. This degree prepares you to take your place in the management of an athletics/activities program in a middle school, high school or university. You’ll have the skills and official requirements to manage the recruiting of athletes and staff, manage facilities, direct public relations and marketing of the program, and perform other duties. You will earn the degree by completing 11 three-credit courses plus 110 hours of field experience in the form of a student internship. You will also create a professional portfolio and a comprehensive athletics/activities administrator manual. This course will focus on laws, rules and regulations for sports and sporting competitions and related activities. Middle school to intercollegiate athletics and activities programs will be examined in relation to their embedded risk management, human resources, safety standards, compliance to the Americans with Disabilities Act, Title IX, student dress codes, conduct codes; plus embedded issues related to sexual harassment, hazing, drug testing and scholarship of athletic/activities program participants. Meeting participant eligibility standards, maintaining amateurism status, institutional contracts and planning for athletics contests, and the development of student athlete and coaching manuals will be covered through practical application activities in this course. Other applications include scheduling, delegation of tasks, conflict resolution and procurement of equipment and personnel. A major, final project will be the development of a comprehensive tournament plan or major activity event/conference plan (e.g. sport competition at the district or regional/state level, conference breakouts and workshops). This capstone course for the program will require completion of 110 hours of clinical field experiences in the form of a student internship, a program professional portfolio in electronic format and a comprehensive athletics/activities administrator manual. All three culminating projects will be required to be submitted for evaluation as a graduation requirement. A review for the CCA (Certified Athletic Administrator) examination will also be included in this course for students who desire this optional national certification after completion of this program. This course will examine the philosophical and organizational approaches to various athletic and activity programs; ranging from those starting at the middle school level to intercollegiate programs. Topics will include organizational structures, program budgeting, communications and leadership techniques. This course will also focus on organizational rules, services and membership of athletics associations such as the NCAA, the NAIA and the National Federation of State High School Activities Associations. This course will explore all facets of the athletics/activities supervision process as it pertains to managing and maintaining facilities; evaluating coaches and support staff; supervising and managing athletic contests, including techniques of spectator management. This course will provide athletics/activities' directors with a broad understanding and better perception of current issues and common challenges they will face in the local and state educational community, as well as those evolving issues on the national and global levels. These include gender equity, emergency/crisis planning as well as issues regarding co-curricular and extra-curricular activities. This course is designed to offer prospective school leaders a balanced approach to the study of educational administration. The course examines the theoretical foundations of school organization and explores the multidimensional roles of the school administrator as educator, leader, manager, and reflective practitioner. Course content focuses on fundamental organizational principles; leadership and decision-making; local school district culture and communication; policy and governance, human resource management; and the values and ethics of school leadership. In learning content, heavy emphasis is placed on collaboration and problem-solving using cases or vignettes. The cases and vignettes were developed to enhance the ability of students preparing for school leadership positions to encounter new situations in educational administration, assess relevant factors, and decide on effective courses of action. This course will aid the athletics/activities administrator in building positive character and citizenship traits for participants in athletics and activities programs. Course content will focus on developing the traits of respect, responsibility, trustworthiness, integrity, sportsmanship, collaboration and fairness. In addition, issues on student motivation, cheating and characteristics of adolescent behavior will be examined. This course will focus on how to share the vision and mission of the program with future participants and community stakeholders. The course will emphasize developing positive relations with the public, speaking in public, communicating with various public media and raising money using fund development methods. Learners will also examine how to encourage community and student involvement with the program. This course will involve the study of department/school finance, program budgeting, profit/loss formulas, bookkeeping, bidding processing for equipment and services procurement, plus the basics of contractual agreements and compensation for officials. William Woods advanced education programs bring evening classrooms to districts and educators where there is interest. Districts in Fulton, Columbia, Jefferson City, St. Louis, Kansas City, Moberly, Springfield, Ozark, Cape Girardeau, Rolla and many more are running cohorts currently or have in the past. 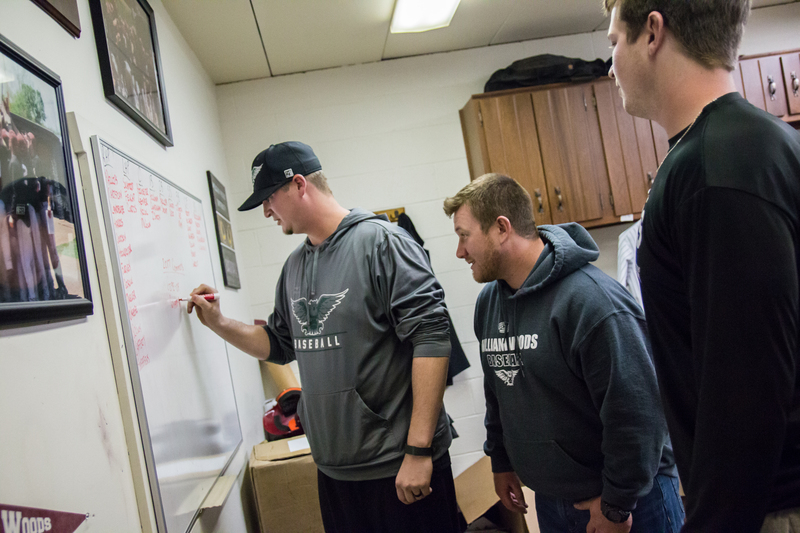 For those students looking to take a less traditional route and interested in earning your degree online, William Woods University also offers an Online Master of Education (MEd) in Athletics / Activities Administration. Many of our graduates hold leadership positions in Missouri’s schools, including leadership in athletics. Learn more about graduate admissions requirements, deadlines, tuition and financial aid available to you.